Part 1 (Take-off): While still on the runway or as the plane takes off can sometimes be the most stressful part of getting on a plane. You feel trapped, confined, anxious, and maybe even irritated! 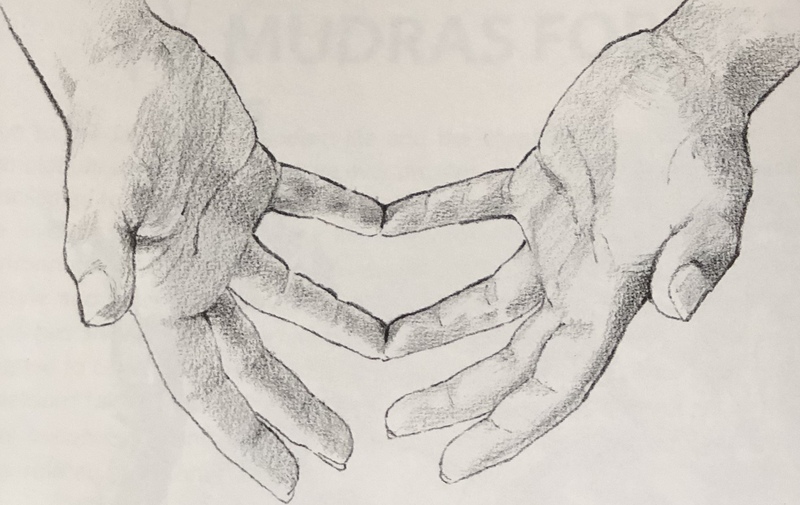 All of these factors make it a great time to implement mudras (body expressions through the hands), practice our breathing, and maybe even focus on a mantra or affirmation. How to→ 1. Hold the hands facing upward below the naval. 2. 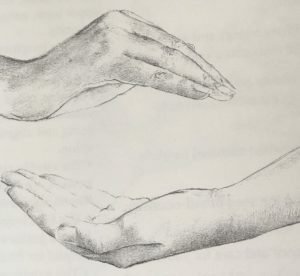 Touch the tips of the little & ring fingers to the same fingers on the opposite hand. Rest the hands below the navel, with the forearms resting against the abdomen or onto the lap. Relax the shoulders back & down, with the spine naturally aligned. How to→ 1. Cup the hands & place the left hand with the palm upward four finger-widths below the naval. 2. Place the right hand with the palm downward at the level of the naval, just above the left hand, with the hands gently touching the abdomen. 3. Relax the shoulders back & down, with the elbows held slightly away from the body & the spine naturally aligned. Part 2 (In-flight): This is a great time to pull out a yoga sequence that you can do right from your seat! The purpose of these moves is to help release any tension that has built up in your muscles, keep the mind calm, and increase circulation throughout your body. Core work (if you have room! )→ From your seat, take your arms out in front of you, sit up tall, and alternate taking your knee up to touch the bottom of your arm. Keep the posture upright- it’s easy to sink the chest forward to make contact easier! Remember- a strong core is KEY to supporting a pain-free spine! Get creative with your leg movements- Try to bring one knee at a time into the chest to get a stretch along the back side of the leg. If you have room, bring your ankle onto your opposite leg to find a stretch through the hip- you can even lean into it! Read a book on a topic that will help you grow as a person or think in a new way! Bring a serape blanket that can double as an in-flight pillow AND a “yoga mat” if you are at an airport that has a Yoga Room! If you are so lucky, run through some Sun Salutations to increase blood flow, raise energy, relieve stress, and feel great! Part 3: Landing: You’re almost to your destination! Take this time to visualize a smooth landing, the new places you get to explore, the progress you will make by getting work done, etc. Come back to your breathing & utilize essential oils for emotional support. Maybe even go back to our take-off mantras! Keep your body calm by using movement (think of our cat/cows) and finding the hands into one of our mudras. I was never trying to be a yoga teacher. I was the girl who came to class and didn’t want to make eye contact with herself in the mirror. I was the awkward one who’s hands were closer to touching her knees than her toes. I was the one who “had no upper body strength”& “had no balance”. But I was also the one who kept coming back. I threw all of my self-doubt out the door and decided I didn’t care. I knew I felt good after practice and that’s the feeling I was chasing. Not some far off dream of being able to do the splits, or crow, or anything else crazy. It didn’t take long and people started noticing my improvements. Then it got to the point that no one knew where I had started- they just said I was “good” at yoga. What did that even mean? I heard of a teacher training program coming up at the studio. My boyfriend and I had just bought a house a month before and I knew it wasn’t “good timing” for me to join. And who was I to be a yoga teacher anyway? But the more I thought about it, the more it made sense. I never want to be the teacher who’s students believe that their inner power is coming from an outside person. I want my students to believe in themselves and build a practice that is meaningful to them. I knew I was coming from a good place, and I’d getting to know this “universe” and “energy” and “vibes” through yoga.. so I thought “why not try it”. I didn’t sign up for the program that day. I didn’t have the money for it. Like I said, we just bought a house and every ounce of money I made went towards my dream of being a musician. So, I made a deal with this new found “universe”. If I could make enough money between now and the time my payment was due to cover the program, I would join. That was EXTREMELY far-fetched at the time. I barely had any gigs coming up and I knew for a fact the money was just not there. But I said the words out loud. I made that solid commitment to the universe, and something amazing manifested. I’d let go of the idea of “trying” to make the money needed to get into my YTT program and just let the universe know that I was ready for it. Within 24 hours I had a couple brand new gigs lined up from people who had heard about me randomly. I was not trying for these things, but I had continuously “thrown darts at the dartboard” and once the universe knew my intention- something stuck. Sure enough, within the time allotted up to the day before… I made the EXACT amount of money needed to enter the teaching program. It was an incredible fit for me- combining my love of biomechanics & teaching that came from the horse world, my love for connecting with people & making playlists from the music world, and my love of choreography, energy, and spirituality from my childhood spent in between the dance studio & church. I’ll leave you with this… do not think that you are not worthy of what the universe has to offer you. It is vastly expansive and you should tell it what it is that you want. Say it out loud, set yourself up for success, and let it work magic within your life. The yoga practice is a great way to set intention for your life and learn how to breathe through tough moments and enjoy the continuous breath throughout the roller coaster of the time on your mat. Take it from the girl who stumbled into a yoga class one time, it can change your whole life if you let it. Do you ever consider just how much impact we have on the world? Every thought impacts our words and our actions… soon creating a life and making a direct affect onto everyone and everything around us. We hold so much power & free-will, yet at the same time have an overwhelming sense of being out of control. When we do even one good deed- it can truly impact the entire world. And one poorly-intended act can do the same as well. I’m a firm believer in karma and what you put out in the universe you’ll always get back. Maybe you walk around with better energy when you’re at peace with yourself and attract good things. Whatever it really is, it certainly can’t hurt to be the best version of yourself and accept blessings with a grateful heart. Its easy to get so caught up in working that we forget to consider the repercussions of our work. I know for myself that I can get really down with my nose to the grindstone never looking at the bigger picture. I forget to look at how far I’ve come but rather how far I have still to go on my journey. But I also think that’s the cool thing about knowing that life is a journey.. we enjoy the steps along the way rather than being so worried about the destination. No one will get out alive and unless we leave behind an amazing legacy, not many will even know we existed in another 100 years. Taking control of our life by recognizing that this is our time can be so liberating. When we’re in a period of feeling trapped in darkness, maybe that’s just our cocoon right before we emerge with beautiful new wings. And that every small movement, like the flutter of a butterfly’s wing will effect the universe. We are each so important, so loved, and so free to choose. We are lucky. We are alive. Well guys, its Valentine’s Day! No matter how that makes you feel as far as being single or having a partner goes… I hope you take some time today to self-reflect. Looking at our relationships and really taking note of how they impact our lives. If that’s positively- take some time to say or do something special for that person-whether its a romantic relationship or not!! Its also a great time to think about our relationship with ourselves- do something for yourself today that makes you feel empowered. Maybe that’s taking a bubble bath with some amazing essential oils, taking a yoga class, making a plan to get some on-sale chocolate tomorrow…. whatever it is- do it for YOU. If you’re feeling bitter towards the holiday, maybe refocus that energy on bringing positivity into your relationship with yourself. We can’t pour from an empty cup and we can’t depend on others to get our fill either. It all starts within us and whatever we take in will pour out to others and come back to us as well! My favorite Valentine’s surprise wasn’t one that I received, but rather what I was able to pull off for one of my best friends. My friend Kristen and I rode horses together for a long time and she always wanted one of her own. She had her mom talked into leasing a horse (keeping the horse just for a little while) for a two-year contract, but she didn’t have a horse in mind or lined up, yet. I snuck out with our riding instructor at the time over to Milan and tried the horse out to see if she’d like him. He was HUGE which was a plus since she’s 6 feet tall herself.. and sweet- so I knew she would love him! We arranged for Cutter (the horse) to come to the barn, her mom had the contract signed & ready.. and I went to grab a few little gifts for him to give to her for Valentine’s Day. He had a fresh braid in his mane and was freshly bathed to make a good first impression. I wrapped some ribbon around the stall he was in along with a “Happy Valentine’s Day” sign on the front with some flowers asking Kristen to be his Valentine. I walked her up to the stall and it took her FOREVER to understand that it was meant for her! She started freaking out and thanking me (about this time her mom walked in too). Truly the best gift is giving someone else something special. I will never forget that moment of giving my friend her first horse and making a very special Valentine’s surprise. Working on being 1% better every day… today I set my alarm for five minutes earlier. I figured since I’m always five minutes late to everything I would start from the beginning of my day and give myself a little more time. Spoiler alert: I still made it to work at the same time- scooting in a few minutes behind schedule as usual. BUT before I left home I did get my dishes done, all of my stuff packed for the day (I usually forget at least one important item), let my car warm up so I wasn’t totally shivering while peering through one corner of my frozen windshield… and even left a note telling my boyfriend to have a good day. Maybe it doesn’t seem like much, but I really feel like it started my day off on the right foot. Its almost 10am and I haven’t yet missed those 5 extra minutes of sleeping, but I do feel more accomplished than most other mornings. I think part of it is the intention as well. I recognized that I don’t feel good about being late all the time so I took a small step towards changing that fact. What is one thing in your life you could improve on by 1%? What would give you that little taste of accomplishment towards a bigger goal? One Day.. or Day One? We all have goals. Some of them seem far-fetched and others might just take time. I think we get into this mindset that one day you’re going to do something… whether it has to do with a fitness journey, a new job, or any other life change… we keep saying to ourselves “one day”. The problem with “one day” is that it isn’t specified as Monday, Tuesday, July, the 1st of the month, 2018… there is no start time for “one day”. Instead of seeing our goals as something a later version of ourself will care about more than the current version.. let’s set those goals into action. Step 1: Write them down. Think about what’s important to you and write it on paper. Put it out into the universe that there is a change you want to make and you have identified what it is. Make it specific, make it timely, make it important to who you want to become. Step 2: Every day be 1% better. When we fail, we give up. Our lives change one choice at a time, so if our goals aren’t happening 1% at a time- we will fail. Acknowledge what you’re getting right and put into action a way to change what you don’t like. This has nothing to do with a time of year, or age in life, or anything else.. it has to do with valuing who you want to be more than the comfortable version of yourself. Change is hard and it takes time. The excitement of the possibility will wear off. Make the goal meaningful to you and know what it is. Be 1% better every day and with time and consistency… you WILL reach any goal you’re wanting to achieve.